The importance of trusting your motivation, developing habits of effective networking and capitalizing on your strengths to find greater consulting success. In today’s episode, I’m joined by Elizabeth Woolfe, a passionate consultant with a focus on nonprofit organizations in the healthcare industry. There is a common misconception in the consulting world that working with nonprofit organizations means that there are no profits to be had for consultants. Many consultants avoid working with nonprofits for this very reason, and you may be one of them. Elizabeth has joined me today to explain how you can create a thriving, successful consulting business in the nonprofit market. We discuss the importance of using your network, trusting yourself, and overcoming business anxiety. She shares examples of how to effectively ask for referrals and how to grow your business to the point that you can choose the clients you are working for. It’s all in this episode of the The Consulting Success Podcast with Elizabeth Woolfe. Does Non-Profit Equal No Profit For Consultants? We start out with Elizabeth sharing the story of how she got connected with nonprofit organizations. She has actually dedicated her career to working with nonprofit organizations once she recognized how greatly nonprofits would benefit from working with a consultant but are often the organizations that are the least able to afford to hire one. Elizabeth has always been interested in the healthcare industry. While her fear of chemistry did keep her from becoming a doctor, she stayed focused in the healthcare field and has had no regrets about her career path. After earning her Master’s in Public Health from UCLA, she began working with health education in New York. Once she was connected with those involved in the breast cancer movement, her work as a consultant began. She saw a need for more support in the movement and started linking organizations with companies that wanted to help with breast cancer awareness. Elizabeth, like so many other successful consultants, identified a gap in her industry and developed a way to fill it. When you truly care about making a difference in the success of your client’s work, your intentions will show through. Your clients will be happy to give you referrals because of the trust that they have in you, and the sincere efforts that you are making to serve others. There is a common misconception in the consulting world that working with non-profit organizations means that there are no profits to be had for consultants, and you may feel the same way. Perhaps you have seen an opportunity to fill a need in your industry but are hesitant because it doesn’t seem possible to get the value you are seeking. Too many consultants avoid working for this very reason, but I think my conversation with Elizabeth will change your mind. She shares four essential ideas on how you, too, can create a thriving, successful consulting business, either in the nonprofit or for-profit market, in this episode of The Consulting Success Podcast. The first essential step to finding success in any industry is to build a network that is filled with people that you can rely on. When Elizabeth decided to start her consulting business, she told everyone she knew about her plan. The trust that people already had in her character and her ability to deliver results brought in some of her first jobs. Even today, almost all of her clients come to her via word of mouth. Her reputation precedes her in all that she does, and the result has always meant more opportunities for work. By actively working her network, Elizabeth has been able to grow her business and continually entertain project requests. She maintains that by being generous with her time and helping other people find solutions to their problems, she is benefitting as well from the strengthened network. There is plenty of room in the consulting world for more than one person to approach a problem, so she doesn’t consider sharing ideas and working through problems with other consultants as competition. Instead, she has been given even more opportunities and referrals as a result of her willingness to work alongside others. There is definitely a benefit to taking advantage of tools such as LinkedIn to help with networking, but there is no real substitute for making personal and real connections with people you have actually met and done business with. Introducing your colleagues to other colleagues will extend your reach, and as Elizabeth says, you really never know where your connections will take you until you actually start making them. If you’ve ever felt unsure of the best way to actually ask for referrals, you need to listen to my conversation with Elizabeth. Consultants generally don’t want to appear too pushy or “salesy” but asking for referrals is one of the best ways that you can secure more work for yourself. 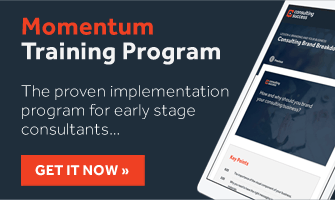 This is Elizabeth’s second critical step in finding success in your consulting business. Once you are deep in the work of your business and effectively connecting with others, asking for referrals should come as a natural part of the conversations that you are having with your clients. Be sure to listen for the specific examples that Elizabeth shares of dialogue that you can use to ask for referrals without putting anyone on the spot or pushing too far. An important distinction to make when asking for referrals is the reason why you are doing it. In Elizabeth’s case with working with nonprofits, the genuine care and concern that she has for helping these organizations succeed is the driving force behind her requests for referrals. When you truly care about making a difference in the success of your client’s work, your intentions will show through. Your clients will be happy to give you referrals because of the trust that they have in you, and the sincere efforts that you are making to serve others. Once you’ve pinpointed your motivation, whether or not you actually land the client doesn’t really matter. The genuine care that comes with your efforts will be apparent, and trust within in your network will continue to grow. You’ll want to listen to our conversation as Elizabeth shares the pivotal moment in which she realized that her success was determined by her motivation, and it started when she started feeling especially anxious about her work. Many consultants deal with anxiety when thinking about the future of their business, clients, and projects. When Elizabeth was faced with these questions, she was given some career-altering advice. She was told the same thing that you will hear me constant telling consultants — trust that what you do is important, use your network, and be confident in the things that your clients are learning from you. That is really the key to finding success in your consultancy. It is essential that you trust in the work that you are doing for the organizations you are working for, and that you believe in yourself. If you can master this step, you will be able to enjoy the confidence and success that comes as a result. Like many consultants, Elizabeth started her consultancy as a result of wanting to achieve a greater balance in her life. Her desire to spend more time with her family and on her interests instead of commuting and working for other people gave her the push she needed to get started. This desire to find more balance brought with it the need to maintain that balance. Building your business can become an all-consuming endeavor, but it doesn’t have to be. Instead of allowing your business to take over you, you have to take control of how you approach it. This is Elizabeth’s third step to success. Marketing, networking, and business development should become a habit that you want to attend to daily. For Elizabeth, this includes participating in educational opportunities such as presentations or webinars that focus on skills development and strategic business planning. Forming the habit of putting yourself in front of prospective clients will support your position as an expert in your marketplace, and you will see greater success in your consultancy as a result. Any efforts that you make to consistently and proactively advance your business will play a great role in your success. The defining difference between consultants that struggle and consultants that succeed is this: thinking about your marketing and thinking about your business plan is not enough. Implementing your plan and working on it day in and day out on a consistent basis will bring you success. As you feed your business engine daily, it will start to gain momentum and you will take your consultancy to the level that you can select who you want to do business with. As we continue our conversation to explore some of the anxiety-inducing facets of consulting, Elizabeth shares some very wise counsel that is her fourth step to consulting success. It is critical that you truly know who you are, what you are good at, and what you enjoy doing. When you focus on these things, you will propel yourself toward success faster. If you overextend yourself or try to branch out beyond your skill set and focus on other things, you may be faced with unnecessary anxiety about your weaknesses and potential failures. Elizabeth shares some of the strategies that she uses to deliberately focus in on her strengths while also allowing herself opportunities for growth. You’ll want to hear her checklist for ideas of ways that you can expand your skill set, education, and expertise as well. Every consultant knows how tempting it can be to take any project that comes along, even if it’s not a great fit for your skillset. In my conversation with Elizabeth, you’ll remember why this is always a bad idea. If you really want to grow your business to the point that you can pick and chose the kinds of ideal clients that you want to work with, it is essential that you learn to say no to the ‘wrong fit’ projects. If you can’t do this you may end up doing work you don’t like with clients you don’t want to be working with. I can promise you that you will do your best work when you are able to charge the highest value for the best clients that you actually want to be working with. Intuition Consulting is the company that was born from Elizabeth’s ability to assess the best clients, the best projects, and the best value of work. By sticking with the standards she has set for herself, she can easily say no to the rest. 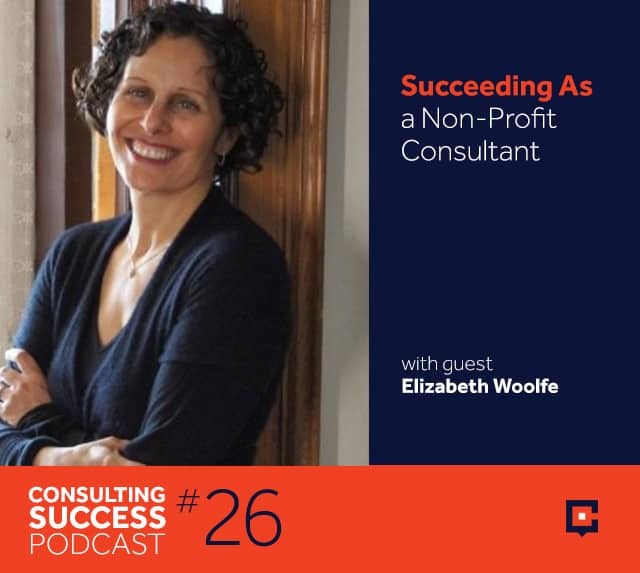 Her success shows that this approach to business is always the best one, and you won’t want to miss out on the experiences and knowledge she shares that prove it, in this episode of the Consulting Success Podcast with Elizabeth Woolfe. [:20] Meeting Elizabeth Wolf, passionate and successful nonprofit organization consultant. [5:05] How your relationships will positively affect your consulting success. [9:03] Effective ways to ask for business referrals. [14:03] Building your confidence, trusting your motivation, and believing in yourself. [17:52] The importance of forming productive business and networking habits. [22:23] How to capitalize on your strengths to secure your success. [25:32] The importance of working with coaches and mentors. [26:23] Connecting with Elizabeth Woolfe. Dear Elizabeth. All I can say is I was blind to working in consulting but now I can see clearly. Thank you for making this possible for me and my consultancy. Thanks for sharing Andrew and glad you enjoyed the interview with Elizabeth.